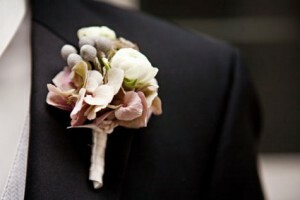 White ranunculus buds with silver berries and accented with soft blush floral petals. 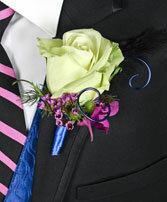 Finished with soft silver ribbon. 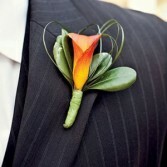 Sunset mini calla lily with looped lily grass and wrapped in black satin ribbon. 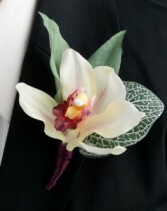 Dramatic orchid with purple accented throat wrapped in purple satin ribbon. 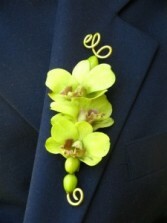 Mint orchid blooms in modern fashion decorated with green wire. 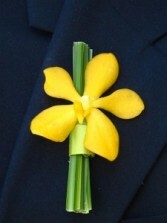 Beautiful and sunny mokara orchid accented by bear grass and tied with citrus green ribbon. 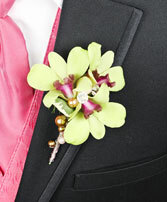 Green orchid blossoms accented by gold beads and diamond tip pins. 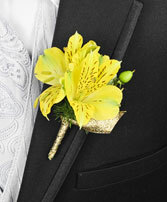 Yellow Peruvian lily blossoms accented by green berries and gold ribbon. Prada Mint rose accented by lavender florets and a magenta orchid bloom. 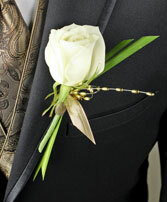 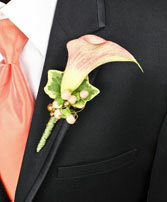 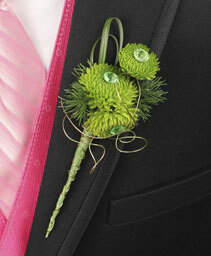 Feather detail frames this stylish boutonniere. 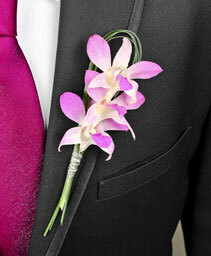 Pink or lavender orchids accented with bear grass and decorative wire. Beautiful peach mini calla lily accented with peach berries and variegated ivy leaf. 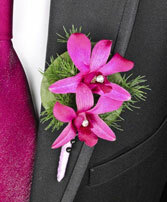 Magenta orchid blossoms accented with lavender ribbon, rhinestones and fern. A creamy white "glitter" rose accented with gold and lily grass and gold ribbon. 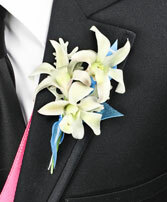 White orchid blossoms accented by Dusty Miller, a silver leaf, rhinestones, and blue ribbon. 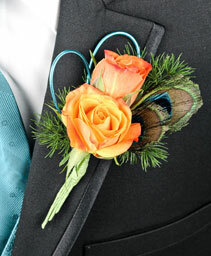 Vibrant orange roses accented by peacock feathers, fern and decorative wire. 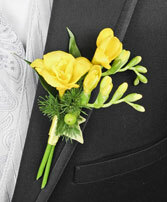 Fragrant freesia blossoms accented with Italian ruskus, berries, and sparkle ribbon. 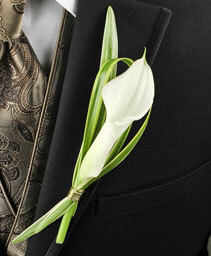 Mini white calla lily accented by decorative wire, greenery styled in a modern fashion. Fun green "Kermit" button mum blossoms accented with rhinestone diamond pins, and looped bear grass.